Duxbury, Jr., Lloyd L. "Dux"
He was a member of the American Legion and Veterans of Foreign Wars. He died at St. Joseph's Hospital in St. Paul, Minnesota. His funeral was held on March 28, 2002 at Immanuel Lutheran Church in Caledonia, Minnesota. He was buried in Evergreen Cemetery in Caledonia, Minnesota. "Duxbury, Lloyd L., Jr., (Obituary)." St. Paul Pioneer Press, March 26, 2002. Egerstrom, Lee. Lloyd Duxbury Was State House Speaker (Obituary)." St. Paul Pioneer Press, March 25, 2002. Powell, Joy. "Lloyd Duxbury, Legislative Reformer, Dies (Obituary)." Star Tribune, March 25, 2002. Lee, Phil. 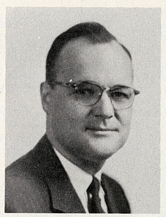 "Rep. Lloyd Duxbury Jr." St. Paul Pioneer Press, January 5, 1969, p. 1, 4.